In this chapter, the concept of equifinality of model representations is discussed, from a background of model applications in the environmental sciences. 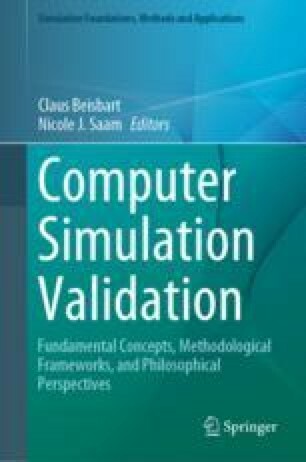 Equifinality in this context is used to indicate that there may be many different model structures, parameter sets and auxiliary conditions that might appear to give equivalent output predictions or acceptable fits to any observation data available for use in model calibration. This does not imply that the resulting ensemble of models will give similar predictions when used to predict the future under some changed conditions. As new information becomes available to allow model validation, this can be used to constrain the ensemble of models within a Bayesian updating framework, although epistemic sources of uncertainty can make it difficult to define appropriate likelihood measures. It seems likely that the equifinality concept will persist into the future in the form of ensembles of (stochastic) model runs being used to estimate prediction uncertainties. However, more research is needed into the limitations of model structures, information content of data sets subject to epistemic uncertainties and means of evaluating and validating models in the inexact sciences. Beven, K. J., & Smith, P. J. (2015). Concepts of information content and likelihood in parameter calibration for hydrological simulation models. ASCE Jornal of Hydrologic. Engineering. https://doi.org/10.1061/(asce)he.1943-5584.0000991. Beven, K. J., Leedal, D. T., McCarthy, S. (2011a). Framework for assessing uncertainty in fluvial flood risk mapping, CIRIA report C721, 2014, at http://www.ciria.org/Resources/Free_publications/fluvial_flood_risk_mapping.aspx. Beven, K., Smith, P. J., & Wood, A. (2011b). On the colour and spin of epistemic error (and what we might do about it). Hydrology and Earth System Sciences, 15, 3123–3133. https://doi.org/10.5194/hess-15-3123-2011. Beven, K. J., Leedal, D. T., & McCarthy, S. (2014). Framework for assessing uncertainty in fluvial flood risk mapping, CIRIA report C721. Available at http://www.ciria.org/Resources/Free_publications/fluvial_flood_risk_mapping.aspx. Mitchell, S, Beven, K. J., Freer, J., & Law, B. (2011). Processes influencing model-data mismatch in drought-stressed, fire-disturbed, eddy flux sites. JGR-Biosciences, 116. https://doi.org/10.1029/2009jg001146. Mizukami, N., Rakovec, O., Newman, A., Clark, M., Wood, A., Gupta, H., et al. (2018). On the choice of calibration metrics for “high flow” estimation using hydrologic models. Hydrology and Earth system Science Discussions. https://www.hydrol-earth-syst-sci-discuss.net/hess-2018-391/.